When the sensors are attached as close as possible to the recording point only very short cables are needed. Recording is possible from two EMG channels per module. Recording of the action potentials of the muscle using disposable electrodes. 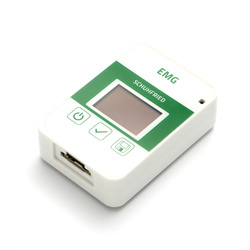 For incontinence training rectal and vaginal electrodes are used to measure the parameters at the recording points. Slow and fast muscle fibers can be measured using different frequency ranges.